With all the priest retreats and parish missions behind me for the year, I am so excited about staying home and cleaning house! Now you might think that is tedious and boring, but not for me! I have always done it as a priest over the holidays, but since I have retired, I will enjoy it even more. I have four four-drawer filing cabinets that I plan to pare down to one. I have already gotten rid of over one hundred obsolete books that I have been dragging around for years. Now all that correspondence and schedules and old airline tickets, from over a hundred priest retreats and texts for speeches that I have in the computer anyway, are headed for the shredder! Who needs old health insurance papers on insurance I longer carry? Who needs the operating manuals on refrigerators, vacuum cleaners and wash machines. I no longer own? It has always been easier to stick more into the same "appliance folder" than it is to clean out the folder! Clothes! I have clothes that are too small for me and clothes that are to big for me - clothes that I haven't worn for years. It's time I get rid of them. If I need a new shirt I will go get one, not rummage through racks of old shirts that I have long since found unwearable. Actually, I find it relaxing to "clean house" and it always makes me feel so much better to go into a new year feeling lighter and thinner! It's time to turn up the music, get out the garbage bags and have a good time! Don't think about calling me! All this applies to my house only! A MIRACLE OUT OF THE BLUE! The moment one definitely commits oneself, then Providence moves too. A whole stream of events issues from the decision, raising in one’s favor all manner of unforeseen incidents, meetings and material assistance, which no man could have dreamed would have come his way. Recently, I completed two priest retreats in the Diocese of London, Ontario, Canada. The money I made, as always, went to my "mission work" down in the Caribbean islands of Saint Vincent and the Grenadines. One priest in particular was so moved by what I was doing in the Caribbean missions that he sent me an e-mail after I got home telling me that he had preached on my mission work and was taking up a collection in the parish since his retirement. I could hardly believe it! I met him while I was there, but I did not know too much about him so I searched his name on the internet and here is his amazing story! Gerry Campeau, Catholic priest and father of 2 set to retire. A Roman Catholic priest who's also a father is a bit of an anomaly. Gerry Campeau is not your typical father. He has two kids and seven grandchildren. But the 75-year-old Campeau is better known as Father Gerry. As in, Father Gerry, the Roman Catholic priest. After Father Gerry's wife passed away from cancer at the age of 52, he says he felt a calling and entered the seminary. It was his second attempt at becoming a priest. After he finished high school, the Tecumseh native enrolled in a seminary but had an early exit. His mother was a divorcee, his father having left her when Gerry was just an infant. When the seminary found out, he was kicked out. "The church didn't want me as a priest simply because it was scandalous," he said. "But you know now, it's no big deal." Campeau went on to a career as a florist, interior designer and entrepreneur. He married and had two children. Two years after his wife passed away he entered a "second career" seminary in Boston. "They told me when I was ordained, my daughter did, 'Remember dad, you're not our priest, you're our father,'" he said. For his daughter Celeste Campeau, Father Gerry is simply known as dad. "I really don't know of my father in any other way. This has always been normal for me so I don't really know any other kind of dad," she said. In did, however, cause some confusion for her three children. "When the kids were really little and would announce to their class or teacher that their grandfather was a priest, they would either correct them or call home to find out what the kids were talking about, only because it was so unusual," she said. For Father Gerry, he incorporates his role as a father and grandfather from his vocation. "He is very well accepted by the people because he understands what it's like to have children, what it's like to have a mortgage, what it's like to worry about a spouses or worry about grandchildren," said Sue Hofgartner, pastoral minister at St. Simon and St Jude. "So he can relate." Father Gerry says if the church allowed priests to get married, it could work in its favour. "We've lost some good priests because they've wanted to marry," he said. "I think it's important to have a family, to know what it's like to belong to someone, to be able to share your life with someone. That I find most difficult because you're very alone. You have a lot of parishioners, but as soon as you lock that door you're going into your rectory and there's nobody there. And that's hard for a lot of the young guys." Next Sunday will be Campeau's last mass St. Simon and St. Jude. Though he should expect a number of well wishes from his congregation before then. "The people are really good. They come out of church on Father's Day, they all wish me happy Father's Day," he said. "It kind of makes me feel good that they acknowledge that I am a father. Father father." Father Gerry, thank you and your generous Canadian parishioners from the bottom of my heart! The SVG missions thank you too! I wish you a great retirement! If you get bored, call me! I have an island just for you! Father Pat Dolan, a fellow priest of the Archdiocese of Louisville, has published his first book - a good versus evil, fantasy/legend set in the cradle of Catholicism in Kentucky. If you enjoy this genre check it out. Here’s a description. 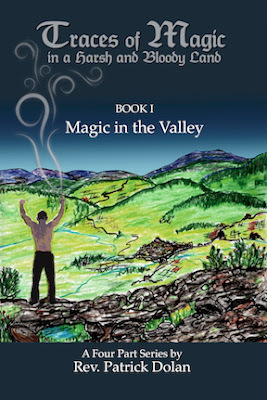 Traces of Magic explores the pre-history of Kentucky, a land strangely uninhabited when Europeans came across the Appalachian Mountains, in ways parallel to how epic tales like the “Lord of the Rings” series unlocked the imagination of the British Isles residents to their pre-history. The story follows the struggles of a group of young adults who get caught up in defending the wonders of their land against an assassins’ guild bent on power and profit regardless of the cost. Knights and bards, clergy and users of magic, as well as many ordinary good people all help defend against the diabolic powers working with that guild to enslave the valley by controlling the weather. “Polish the shield and sharpen the sword - a beautiful story that transcends fantasy by blending in the beauty and goodness of our Roman Catholic faith.” Army veteran Howard Mohn, a Missouri cattle rancher. Congratulations to Father Dolan and welcome to the world of self-publishing! Do not be afraid. Your jar of flour shall not go empty, nor the jug of oil run dry. Our readings today, especially the first one, give us a case in point. It reminds me of the reading about three men showing up at the tent of Abraham and Sarah seeking hospitality. If you lived out West in an isolated mountain cabin and you looked up one day to see three men approaching your cabin, you would usher the kids inside and grab your gun. Your first instinct would be to protect yourself from a threat. If you did not know them, you would no doubt assume, until proven otherwise, that they were up to no good. If you live in an urban area, you would not think of opening your door to three unknown men who came up on your porch and rang your doorbell, especially if you were home alone. You would probably ignore the doorbell, maybe speak to them through a locked screen, make sure you had something to protect yourself handy or even call the police. If you did not know them, you would no doubt assume, until proven otherwise, that they were up to no good. We see this difference especially in the story of the call of Abraham and Sarah. We see Abraham doing something that we have been warned never to do. In the heat of the day, he is resting in the shade of his tent. When Abraham looks up and sees three men approaching, it says that he runs to meet them, bows down to them, invites them in and treats them like royalty – without even knowing who they are or what they want. He invites them to sit under a shade tree while he has water brought to cool their feet, gives orders to have some fresh bread baked, have a tender calf slaughtered and some cottage cheese made. He waits on them as they eat it under the tree before continuing their journey. It is during this hospitality that he and his aging wife are told they will soon have their first child. This kind of hospitality is still common among the nomadic herders of sheep and goats who range about the Middle East as they try to live much as their ancestors have for centuries. Desert nomads, even today, are known for their sumptuous hospitality. The abundance of their generosity stands in sharp contrast to the desolate terrain in which they live. But their generosity is not just something nice to do for other people, in some kind of sentimental way. For them, it is a matter of survival. They know that counting on this tradition could one day mean the difference between life and death for themselves and their loved ones. If you live in that part of the world, you simply must be able to count on the hospitality of strangers. Even in such a situation, biblical hospitality is always a give-and-take proposition as well. The host knows that strangers always bless them with gifts of their own: news from the outside world, fascinating conversation in a very dull and tedious landscape or maybe a bottle of exotic spices from some faraway place. In our first reading today, we see the obligation to offer hospitality in stark terms. Elijah receives bread from a desperately poor widow of Zarephath. Even though she is down to a handful of flour and a few drops of oil, she gives it away to a stranger rather than violate her obligation to hospitality. In the Emmaus story, on the first Easter Sunday, when Cleophas and his friend invite the stranger they meet on the road to their home for dinner, they receive a tremendous gift – the presence of the risen Lord himself. In the case of Abraham and Sarah, it is an important and unexpected message from God himself. It is in this situation, from these three strangers, that Abraham and Sarah first hear that they are going to have their first baby - a precious son – even in their advanced age. In the case of the poor widow we read about today, she receives an unending supply of flour and oil in the midst of famine. Hospitality can be a tricky business in our culture where we are taught, rightly so, to fear strangers, so how can we practice biblical hospitality without putting our lives at risk? In a word, by being open, in an appropriate way, to a variety of people and the gifts God sends us through them. One of the blessings of my life as a priest is being exposed to a variety of people, being welcomed by them and receiving the gifts they have to offer. I have led well over 100 priest retreats in ten countries around the world. I just got back from one in San Antonio, Texas. I used to run a program at Saint Meinrad called "World Priest." We helped acclimate priests from all over the world to American culture. My work in the Caribbean missions keeps bringing me new insights. Here at the Cathedral, we used to say, "all are welcome" and "we will take anybody!" I am proud of the fact that, because of this exposure, I can relate to people of various cultures, millionaires and street people, Protestants, Jews and agnostics, the highly educated and those who have no formal education to speak of, those who have traveled the world and those who have never really left home. My ministry has brought me in close contact with Asians, Africans, Europeans, Koreans, Indians, Caribbeans, Central and South Americans and almost everything in between. By being open to them, welcoming them into my life and being received by them, I have received blessings beyond what I could never imagine as a child growing up in a small, rural town. One of the great blessings of being a college student or seminarian these days is the opportunity to receive blessings from a variety of new people, if you are open to them. On campus, they are exposed to a variety of religions and ways of living. They are offered opportunities to learn new languages and experience other cultures, both there and on study trips. They may meet lifetime friends and maybe even a lifetime partner. If they are open to receiving new people into their lives, as well as being received into the lives of new people, blessings and even messages from God are possible for them. There is also another kind of hospitality you can practice – intellectual hospitality, an openness to learn all you can from the people around you. By committing to intellectual hospitality, an openness to sharing and receiving knowledge and insights, you can correct your own thinking and even find a fresh understanding of God. This sharing is marked by consideration toward others and recognition that others’ distinctive individualities and overall experiences are sources of learning, as much as the information found in books. This receiving is often marked by an awareness that however initially strange it may appear at first, the perspective of others can enrich, and even transform, one’s self-understanding. This parish is blessed with several new nationalities that have enriched us all. God, not doubt, still has many more wonderful gifts for you These gifts, no doubt, will be delivered to you by the unlikeliest of people, if you are open to all those who enter your life. Practice the spiritual art of hospitality and watch as your life is enriched! Restricting your life to one or two types of people is to forfeit untold blessings. Being open to blessings is the surest way of being blessed.